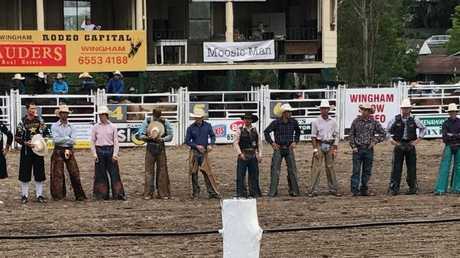 Bullriders from the Wingham Rodeo stand in solidarity for a young bull rider who was injured by a bull on Saturday, March 10, 2018. 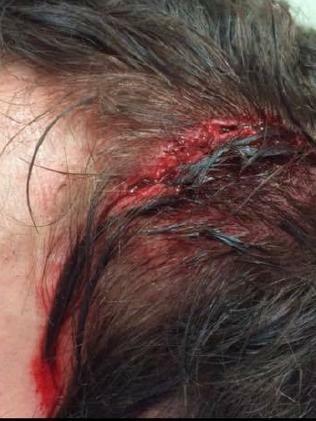 A BULL rider was lucky to escape serious injury after he was gored in the head during a rodeo event in country NSW over the weekend. Danny Worth, 20, was flung from a bucking bull only seconds into his ride at the Wingham Rodeo on Saturday and tumbled awkwardly to the ground near the animal's head. The rearing bull thrashed wildly at the grounded rider with its horns, piercing and knocking off the man's helmet and causing large lacerations to the side of his head. Danny Worth escaped serious injury. Mr Worth was able to extract himself from the flurry of horns and used his last vestiges of adrenaline to scramble over a nearby fence to safety. 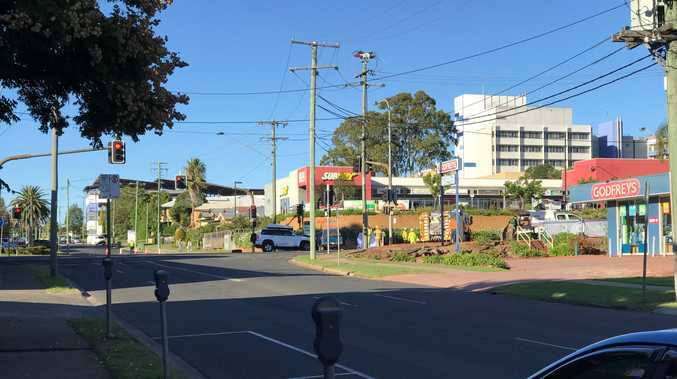 He was flown to John Hunter Hospital in a stable condition with minor injuries to the head. The brave bull rider has since taken to Facebook to share a video of his narrow escape, as well as a number of photos from the aftermath. "Yes, I was (rushed to hospital) on Saturday night. 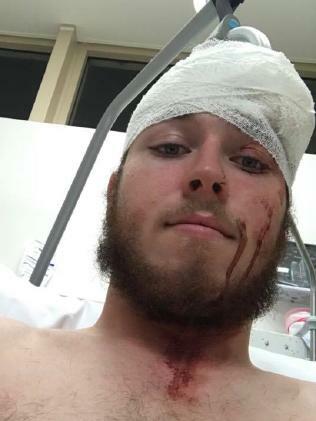 I suffered two blows from a bull's horn to the head where the first one ripped my helmet clean off my head and the second gave me a gash along the top of my head," Mr Worth shared on his page. Worth suffered cuts to the head. 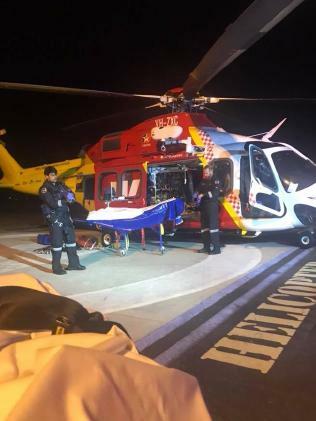 Bull rider Danny Worth was flown to hospital. 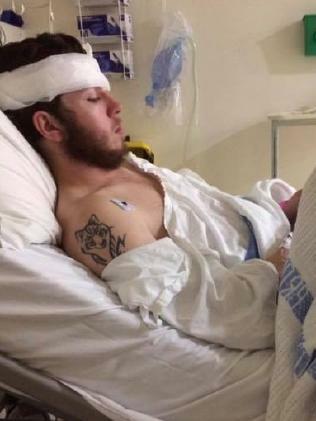 "I was then rushed to John Hunter hospital with suspected spinal as well as the cut once in John Hunter I stayed overnight where I got seven staples put in the hold to wound back together." Mr Worth seemed in good spirits joking with friends that he couldn't believe the bull "slapped" him and commenting that he would "be fine for the next one". Wingham Rodeo event organisers said the rider was saved by his safety equipment. 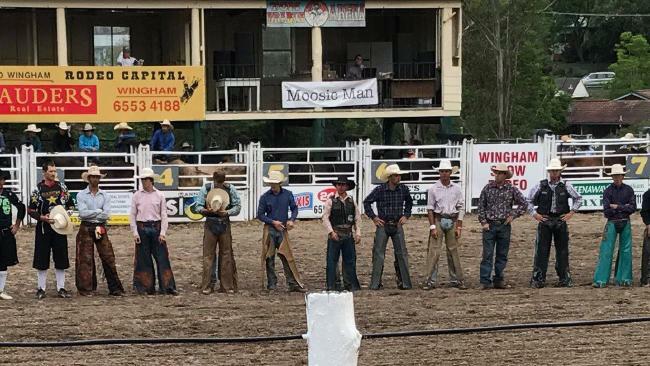 Bull riders from the Wingham Rodeo stand in solidarity for a young bull rider who was injured by a bull on Saturday. "Our young bull rider that was injured on Saturday night, was lucky," the organisers posted yesterday. "Wearing the proper headgear saved him from more serious injury. Bull riding is a tough sport, that's why all safety precautions are taken with riders and bulls. "The Wingham Show committee has kept in touch with the rider, and pleased to announce that he is recovering well in John Hunter Hospital. "Good news that the injury is not as serious as first thought, and the medical teams swung into action immediately to get him the best care.